At 12th Street and Fairmount Avenue, an empty green space that’s part of the reconfigured Richard Allen Homes stands as a reminder of the limits of incremental, small-scale urban investment, circa 1961. That year, neighbors in West Poplar, the area of Philadelphia with most vacant, tax-delinquent and code-violating property, banded together to build a park and playground called the Melon Neighborhood Common. At a moment—not altogether different from today—when the need for urban investment outstripped the limited city budget, the choice to “do more with less” created unprecedented opportunities for resident participation in neighborhood projects. Indeed, the hope was that this sort of approach would catalyze gradual community-led change. But ultimately, without broader investment the effort proved inadequate. Richard Allen Homes, finished in 1941, extended from Fairmount Avenue to Poplar Street, 12th Street to the Reading Railroad line at Ninth Street. It was the city’s first low-income housing project. By the early 1960s, it was overcrowded and increasingly run-down. Along with the physical deterioration of the neighborhood, instances of petty crime and violence amongst poor youths in North Central Philadelphia rose sharply during the 1950s. Long before gangs became a public concern in the late 1960s, “delinquency” was on the tongues of city and philanthropic agencies working in West Poplar. The high concentration of families with young children in the Richard Allen Homes and decades of neglect of the area by city authorities led to a serious shortage of recreational space and other facilities for children and young people. Lack of supervision from parents, scarce recreational and vocational opportunities, and the prevalence of vacant homes and lots, many theorized, led to the rise in behavioral problems amongst youths. For West Poplar and other areas of the city labeled A and B, Dilworth and his development director William Rafsky decided to pursue aggressive code enforcement and demolish degraded buildings in order to arrest further deterioration. As part of this strategy, City Council enacted a policy in 1959 to allow the Department of Licenses & Inspections to acquire tax-delinquent properties through sheriff sale and then turn those properties over to community groups for recreational or other uses. For a time, residents of the city’s poorest areas were told to expect little help from the city government. This motivated grassroots efforts to improve neighborhoods in small ways, including “clean-up paint-up” programs and other self-help work led by block captions. L&I’s land acquisition program sparked hope that citizens could work together to improve their own environment. The Melon Neighborhood Commons, also called the Melon Block Project and the Melon Play Park, became the pilot for this program. Demolition phase, summer of 1961. Cornman School is visible in the background | Image courtesy of Center of Environmental Design Archive, University of California, Berkeley. Karl Linn Collection. Because the project combined code compliance, vocational training, and recreation, it seemed an ideal first step to address the neighborhood’s most pressing issues. For years, social workers at the Friends Neighborhood Guild, a Quaker charity organization committed to improving North Philadelphia since the nineteenth century, had been eying a site across from the Oliver Cornman School and just south of Richard Allen homes for a community playground. To ensure residents’ participation, the Guild joined forces with the West Poplar Civic League, a newly formed community organization dedicated to bettering the neighborhood through self-help efforts. They also accepted the help of landscape architect Karl Linn and his students at the University of Pennsylvania to design the grounds and play equipment. The design included rolling topography, an amphitheater, a sandpit for young children, and inventively designed play structures. All the materials for the project were salvaged from dilapidated houses in the surrounding area. The bulk of heavy work, clearing and leveling the site and the initial construction, was done in a ten-week period in the summer of 1961 by high school and college-age workers form the Friends Work Camp. Neighborhood boys and some older residents helped, working along-side hired skilled workers from the area who completed difficult tasks. Scavenging for marble steps for the amphitheater became an evening activity to avoid conflicts with the construction workers’ union. According to community workers, the idea behind building the park was not only to physically improve the area, but also to provide a platform for the development of leadership, institutional procedures, and positive relations with city agencies that would encourage more ambitious self-help schemes in the future. As a tangible sign of progress, workers hoped that residents’ despair and self-preservation might be replaced by a collective commitment to neighborhood improvement. Initially, the plan appeared to be working. The park was the main motivation behind the organization of the West Poplar Civic League and it became its biggest success. The Philadelphia Tribune and other newspapers lauded the park and on August 15, 1961, Mayor Dilworth and other City officials attended the opening ceremony. The park’s day-to-day operations fell to the Friends Neighborhood Guild and the West Poplar Civic League. In the summers of 1962 and 1963 the Guild sponsored movie nights, provided a full-time playground supervisor, games and other activities for children on the Melon site. Despite this effort, the quantity of use, lack of round-the-clock supervision and funds for maintenance led to the destruction of equipment and the theft and vandalism of many of the material elements, including the marble steps. 1964 marked a change. Gang violence escalated. The 12th and Poplar gang and the 12th and Oxford gangs (made famous in its film, The Jungle) fought over territory around the site. The Columbia Avenue riot—ostensibly to bring attention to neglect and discrimination—altered community dynamics. The City, under the Department of Recreation, launched Human Renewal for youth in the neighborhood. But Rec Department officials refused to take over Melon Park, presumably because the park’s grassroots origins ran counter to the coordinated top-down programs preferred by the City. And anti-poverty programs, which focused more on job training than recreation, had no budget for the maintenance of the Melon Commons. Participation in the West Poplar Civic League dwindled as residents became frustrated at the lack of follow-through on promised improvements. In addition, a growing black power movement developed an antagonistic attitude towards Friends Neighborhood Guild programs in the area. The landscape architects and other outside volunteers used their experience in self-help and “participatory” design to gain appointments in federal War on Poverty programs and international aid work in organizations like the fledgling Peace Corps. In the 1990s, the site was finally completely cleared to make way for city-run elderly housing. The original Richard Allen Homes was demolished and replaced by new, suburban style housing. Cornman School still overlooks the site; the outlines of Melon’s rolling hills remain. Author’s Note: If you have memories of participating in the Melon Park Project, either through its construction or as a child playing there, and would like to share them, please leave a comment below or contact the author. 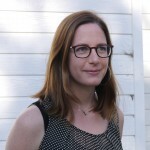 Anna Goodman is a Ph.D. candidate in the Department of Architecture at the University of California, Berkeley. She received an M.S. from Berkeley and a B.Arch. from Rice University. Currently, she is working on a dissertation on community engagement and design-build pedagogy in American architectural education.